I invited Lara from Food. Soil. Thread. to do a guest post here while I’m supposed to be frantically assembling the last of my MFA application (not taking Facebook quizzes about which “drunk writer” I’m most like … Ernest Hemingway, FYI, which I think means I deserve an MFA and that I should never own guns). I read Lara’s blog regularly, where she posts recipes for delicious, different things like West African Chicken Stew and squash with peanuts and tofu. We have a lot in common, I think, except that I am maniacal and probably a degenerate, and she is calm and quilts and seems reasonably responsible. We might both be Pacific Northwesterly hippies, or yuppies, but you can definitely find us both at or near farms. Go visit Lara, and be sure to say hello! By Lara of Food. Soil. Thread. My husband and I have been arguing for years about whether or not he is married to a hippie. He insists, rather urgently, that he is most definitely not married to a hippie despite such evidence as my frequent trips to hot springs, the eating of tofu and hummus, an aversion to chemical cleaning products (“What’s that smell? Is that air freshener? Are you trying to kill me? 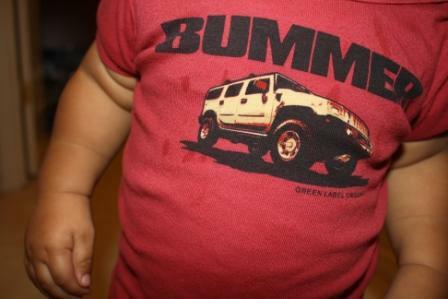 !“), and an intense dislike of Hummers and all that they represent. I continue to insist that I am a hippie, mostly because I like any attention from him even if it is negative. But now I am starting to wonder … what is a hippie nowadays? Does being a hippie in the 21st century require that you wear patchouli and not shave your armpits even when you have access to a razor? Do non-hippies dress their babies in tie-dyed onesies and shirts that say “locally produced” too? The indoctrination begins early: vaguely political onesies. Maybe the modern hippie is just a yuppie-hipster. Some of the things hippies and yuppie-hipsters have in common include recycling, organic food, and shopping at farmers markets. They think the Prius is cool, and the yuppie can afford one. Being a modern hippie is of course all my mother’s fault. To read about my hippie origins, hop on over to my blog where I have provided my evidence, along with a recipe for granola. < Previous Too many things! Next > Potato and kale “Dutch” quesadillas.